The Mysterious Abyss is a Keychain for Sora's Keyblade which appears in Kingdom Hearts II. 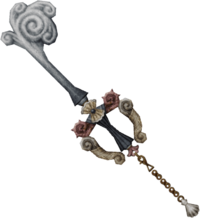 In Kingdom Hearts II, Sora obtains this Keychain after defeating Ursula in Atlantica. The teeth and blade of the Keyblade are in the shape of a water spout. The token is in the shape of a white shell connected to the handle which is made up of assorted shells by a golden chain. In the center of the guard is a shell that has a small blue pearl in the middle. This page was last edited on 6 September 2016, at 15:01.